Back in 2010, when I first came to live at Angus Manor (now The Ainsley Institute of Scientific Studies and Advanced Bunny Killing), me and my brother Angus would go to the dog park often. Until a Fall day in 2010. On that day, several dogs, including 2 pitbulls, were in the park when Angus and me arrived. No sooner had we gotten in then fence then one Pitbull came after me. No problem, I thought. I promptly rolled over, which is universal dog language for “I’m Just a Pup – I submit to you, oh Attacking Dog” – and the attacking dog knows to back off. Except this Pitbull didn’t play by those universal rules. It took my rolling over as a sign of weakness (which it is)…and as a sign to kill (which it shouldn’t). So Mama was screaming at the top of her lungs while the Pitbull’s hoomans were just standing there, looking quite stoopid. Where was Angus and My Hooman Male Staffer (aka Catman),, you ask? They were occupied to ANOTHER pit bull, that was related to the one attacking me. But Angus – he wasn’t the roll over kind. He was being attacked, but he was giving back as good as he was getting. That Angus was always a giver, I suppose. So Catman scooped up Angus, while fending off his Pitbull, and came running and got me away from my killer pitbull. So we ceded the dog park that day to the Pitbull Duo. And we didn’t come back much. 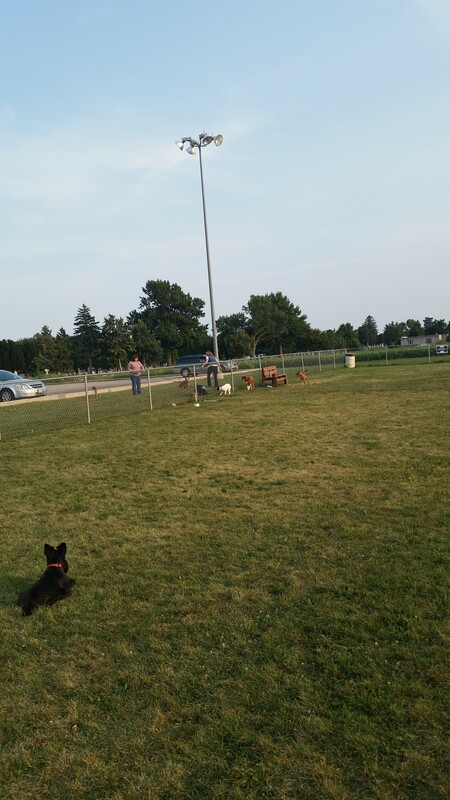 And I wasn’t the same at the dog park – more tentative – less joyful. And as Angus’s Cushings Disease progressed, he wasn’t into ball playing anymore, so over the last few years, we rarely went. 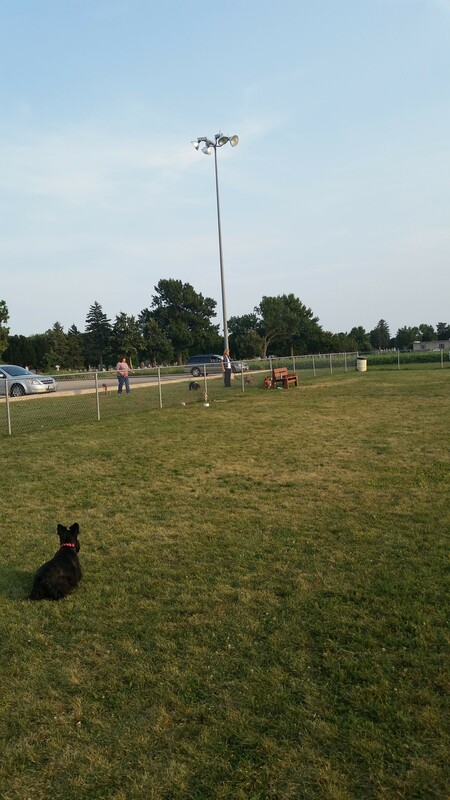 Now that Angus has gone, I’ve visited the dog park a couple of times. But since I don’t play ball, staff noticed I don’t really play with the other dogs like I did before the Pitbull incident. So the staff didn’t think I cared that much for the park. However, Wednesday night, after Ice Cream, we drove by, and Mama could hear a little perceptible whine from me as we drove by. So Catman said, “Sweetie, I will take you tomorrow” So that’s what we did. So fast forward to Thursday. There were several dogs there…a couple of small dogs, an Australian Shepard, a dog of undeterminate origin, maybe a Lab, and one or two others. We were there about 10 minutes…I didn’t really play with any of them. Didn’t associate with them really, but I watched them. Just watched them from a few feet away. But lo and behold, look who is coming in. A PITBULL! A full grown, probably 100 pounds worth of death dealing muscle brained Pitbull. I sat at a distance, and watched the Pitbull approach. If you look carefully, you can see the tan colored pitbull on the side of the fence about to come in. I am watching intently. Planning. Calculating. Plotting. BUT I’M Not done with you yet Pitbull! 5 years of grievance and resentment is coursing through my veins! GRRRRRRRRRRRRRRRRRR – BAAARRRRRK – GRRRRRRRRRRRRRRR! Pitbull rolls over, and I jump him. Pulled away. Then again. And then Again! Finally Catman takes me away. Didn’t mess with any of the other dogs. Just the Pitbull. And I now have settled the score against The Pitbulls. Scotties 1, Pitbulls 0! I think I should get a promotion for this. Was no one filming the attack? Another promotion is definitely in order. Was no one filming the attack? Another promotion is definitely in order for sure, Sweetie. Well done Ainsley, and yes, a promotion is in order. Remember the SOB Pitt Bull who bit my Mama? Her wrist will never be the same. They aren’t dogs. They are on steroids or something. Will this make you a General now, or Chairman of the Joint Chiefs of Staff? You are to be commended on your quick action and bravery. You’re my hero. I hates pitbulls… one tried to kill me in my front yard but my Daddy punted it offa me.. it sailed thru da air about 10 feet… but it still didn’t leave my yard till its hooman showed up and dragged it off. Daddy limped fur weeks– but I wuz saved. Momma sez she duzn’t unnerstand why anyone would want a pup dat could do da kinda damage dey can do…. dey just don’t lets go if one gits ya. You our heroine..not only were you dominant over the enemy but your esponiage tactics are as top notch as possible. A good spy sees and remembers and takes action when every one, especially the enemy, forgets. I disagree a bit. Pit bulls are dogs but they’re also individuals. It’s how they were brought up. You had a pittie submit to you. It wasn’t the same individual. You speak dog and you knew. This wasn’t the same pittie and wanted to be friends. Don’t revenge on the innocent. It works in reverse. Some peeps were afraid of Kyl because they thought Scotties were mean dogs. Well done Ainsley! And without the help of your Polymer Based Cranium Protection Device! Good stuff right there! Yeh !!! I second that Ainsley….PROMOTION. Good on you for settling the score. They will forever now be wimps. You are so brave Ainsley. A pitbull jumped a 6 foot fence and bit my ear 3 years ago while we were just walking around here. I hate them too. Glad you stood up for yourself. My friend has two pit bulls who are very sweet and loving. now that you have gotten your payback may I suggest a respectful distance with others of that bread? That is totally amazing. 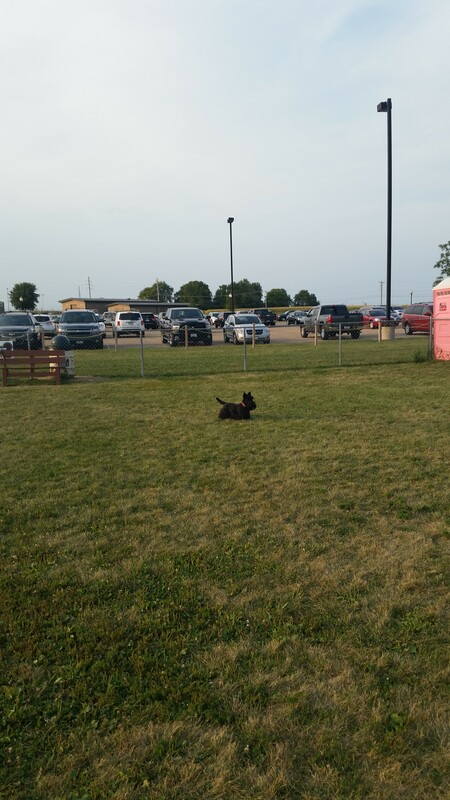 I’ve always read that of all the breeds, Scotties never let go of a grievance, and you certainly have proved this. 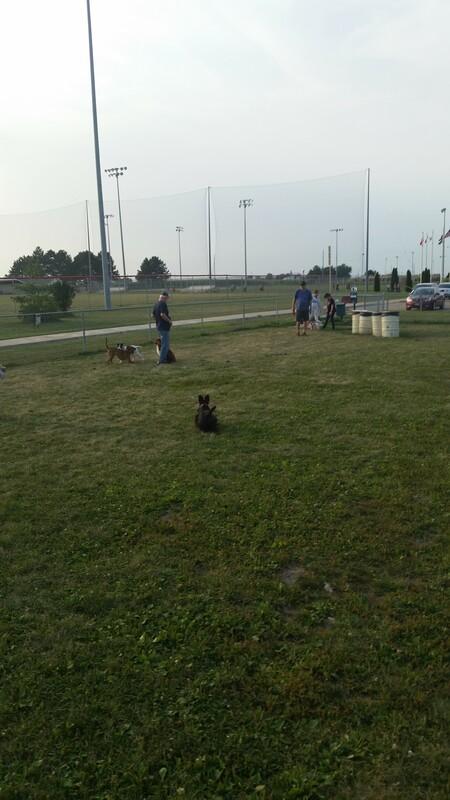 Our dog park has two sections, one for small dogs and one for big dogs. Small dogs can go into the big dog part if they’re geared for it or live with a big dog, but the big dogs can never, ever go into the small dog part. It’s saved lots of lives and nerves this way. And, after that little pay-back salvo, I would say you do deserve that promotion. Captain Ainsley! I’m so digging the sound of that!!! WHOOOOO-HAAAAAA!